Almost anyone can produce content, but it takes a good Instructional Designer to add awareness. Saffer (2007) partially defines this awareness as the product being able to sense and respond to the user. For Instructional Designers, this means the elearning platform should be able to respond and guide the learners in their quest to master a new skill or task. For some related techniques, see Designing for Agile Learning. Interaction design is considered contextual as it relates to a situation by solving specific problems under a set of circumstances. 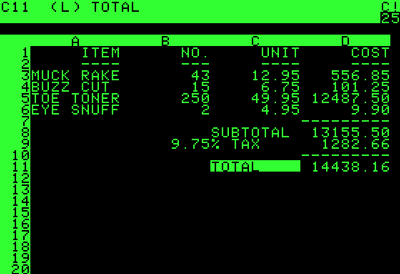 For example, VisiCac was the first spreadsheet program available for personal computers—it was one of the main reasons the Apple II became a best seller at the time as it allowed business owners to easily perform what/if calculations. Normally, the primary purpose of a learning platform is to help the organization achieve a goal (normally referred to as a Business Outcome or Business Linkage). In order for the learning platform to achieve the organization's initiatives, strategies, and goals it must have certain interactions built into it that allow the learners to master the new skills that will achieve these goals. (Garnevale, Gainer, Villet, 1990). Since initiatives normally change over time, a particular learning platform will either change or become obsolete. While the above contextual nature of Interaction Design shows its connection to the needs of the business, the Learner's Framework shows that we must also identify the needs of the learners. In the top right hand corner are Pathfinders who are fully engaged and take a long-term perspective. These learners require full mastery of the skills. Below them, in the bottom right-hand corner, are Organizers who are highly engaged but take a short-term view. Next door to them, in the bottom left-hand corner, are Onlookers who take a short-term view and have low engagement. 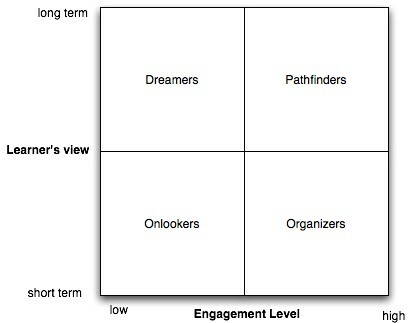 Above them, in the upper left-hand corner, are Dreamers who have a long-term view, but have low engagement. 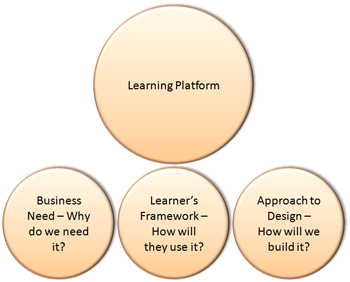 Most learning platforms can be built using a combination of these designs; however, normally one of them is prominent. 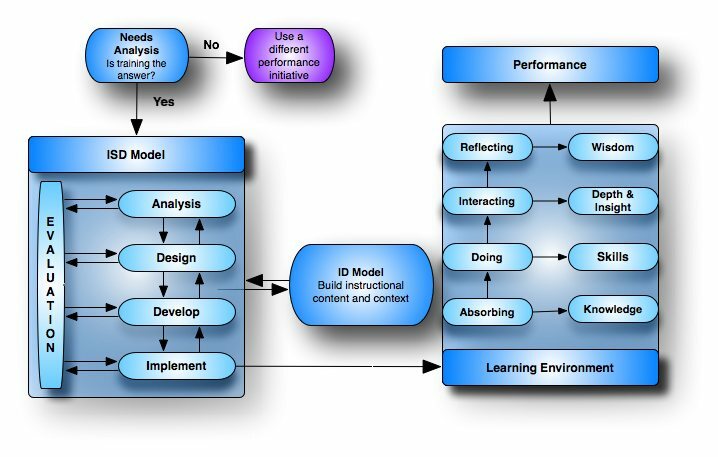 This design focuses on the tasks that are composed of actions and decisions that the learners need to perform. A Learning Designer uses an Exemplary Performer as a model and then they build the instructional content and add awareness to it. Guru Design focuses on the skills and knowledge of Subject Matter Experts. A Learning Designer interviews one or more SMEs as knowledge sources and then they build the instructional content and add awareness to it. This type of design focuses on the needs and goals of the learners who guide the design; while the Learning Designer aids with the content and awareness. It is based on the concept that the people who use a product or service know what their needs, preferences, and goals are, thus they and the Learning Designer collaborate throughout every stage of the design process to build the content and awareness. It should be noted that the vast majority of so called “Learner-Centered” Designs in use today are based on the other three design techniques because they focus on what others think the needs and goals of the learners should be, not what the learners think they should be—that is, they rarely use the learners as the primary information source. System Design focuses on the system's inputs, outputs, processes, feedback loops, goals, etc. to guide the design. 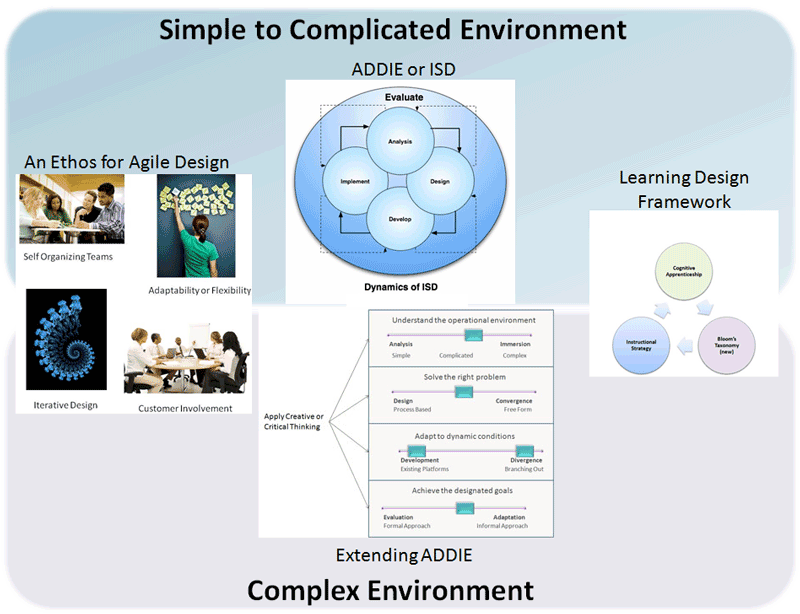 Note that ISD models, such as ADDIE, are combinations of System Design, Guru Design, and Performance Centered Design. For more information on how these four approaches are used, see Designing for Agile Learning. Saffer, D. (2007). Designing for Interactions: Creating Smart Applications and Clever Devices. Berkeley, CA: New Riders. Updated December 9, 2015. Created December 4, 2010.